Wanda Shum Design: Playing Leapfrog! I just completed this teapot recently. As usual, nothing's painted on. The complex details are polymer clay canes. This piece also has a mixture of texture sheet mokume gane techniques, carved and inlaid work. It took around six bakings to complete it and wet sanded to a satinlike finish. I am a tea/teapot lover in Montreal. One of my favourite spots there is this teahouse. It's frog-themed. 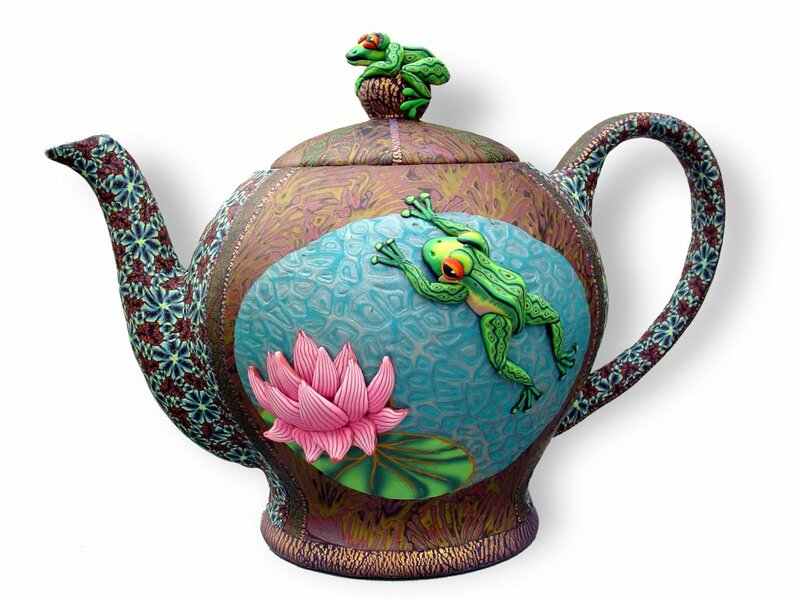 What would I have to do to get this teapot? If you're interested in this teapot, it's still available. For a price of course! You can email me at wandas@mts.net if you're serious.